House decoration is more than ornamental to the Gurunsi people of Burkina Faso. It is a communal activity that shapes their social and spiritual life. Known for their elaborately decorated houses, the Gurunsi – one of Burkina Faso’s 60 distinct ethnic groups – live in the southern savanna of Tiebélé, near the Ghana boarder. The Gurunsi grow grain, beans, and yams in village fields, and live in family compounds surrounding a community courtyard and corral. 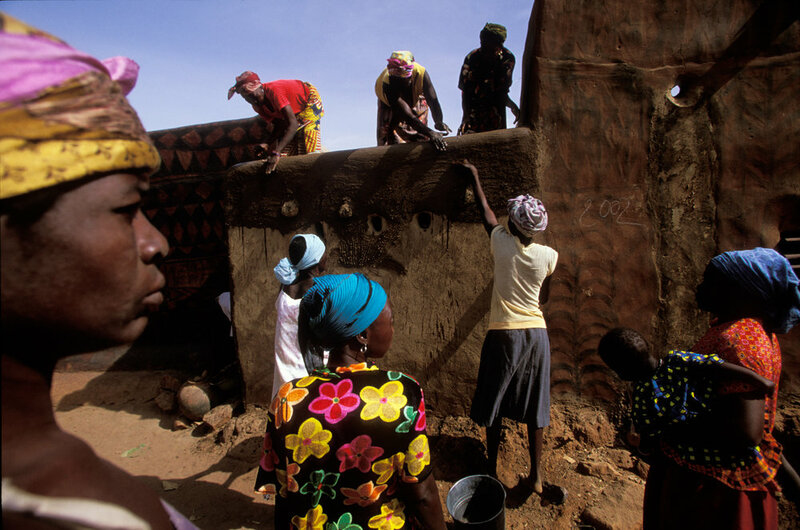 Most of the smooth-walled, mud-brick homes in Tiebélé are covered with elaborate geometric artwork painstakingly created by village women using straw, feathers, and small stones during an annual art and cultural festival that also includes non-stop musical performances and other community activities. Encouraged by gifts of locally brewed beer, the women of Tiebélé vie to create the most beautiful designs, stopping only to sing and dance joyously as bands of musicians and drummers parade through the narrow streets.